This thoughtful rosary and card set comes with a handcrafted rosary and a sturdy prayer card, both exclusive to The Catholic Company. 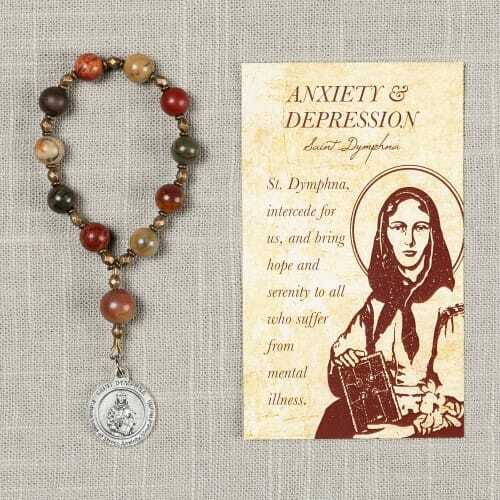 The jasper rosary features marbled tones and antique bronze, along with a silver medal of St. Dymphna, patron saint of those with mental illnesses. A meaningful gift of prayer and healing for anyone who is distressed, especially those with serious difficulties like chronic anxiety or depression. A neutral design for men or women, perfect for slipping in a pocket or keeping on a bedside table. Front: St. Dymphna, intercede for us, and bring hope and serenity to all who suffer from mental illness. Back: "Gentle St. Dymphna, patron of those suffering from mental illness, through your kind intercession may Christ restore my strength, hope, and peace of mind and heart. Just as you so patiently bore the illness and persecution of your father, obtain for me the patience I need, so that I may accept the trials of my life with loving resignation to the will of God. In the midst of daily struggles, help me to love God with my whole heart and serve Him faithfully. Recommend my request to Mary, Queen of Peace and Comforter of the Afflicted, that both of you may present it to Jesus, the Divine Physician. Amen."